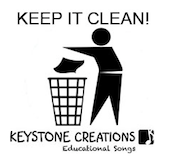 Clean up your school with this catchy tune from Australian duo, Keystone Creations! This song is available on Keystone Creation's Integrated Curriculum in Song First Year, Integrated Curriculum in Song 2nd & 3rd year, Living Values In Song, and on Civics and Citizenship. A slightly shorter version is available on Sing to Learn.